Replacing a legend is often a very hard thing to do, even in the world of Santa Claus. 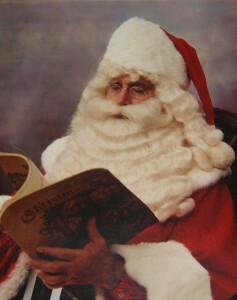 Ray Jochum began playing Santa Claus at the age of 22 in 1938 in St. Henry, Indiana. He was widely known as Santa in the communities around Santa Claus, Indiana but was never known nationally like Santa Jim Yellig. After Yellig’s death in 1984, Ray Jochum became the official Santa Claus of Santa Claus Land. Jochum worked with the park until his death in 1992 at the age of 75.